At the end of the day, the Target connected-home initiative is nothing new. Virtually all the big retailers have tried piling rows of shelves with smart products. Those same retailers ultimately pulled the plug after a year or two of little ROI to show for all that expensive floor space. 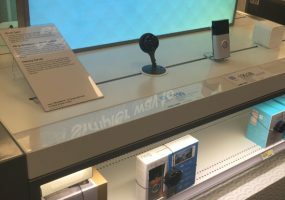 Home Depot, Staples, Lowe’s, Walmart, Best Buy (barely), Sears, and of course Radio Shack back in the day haven’t really been able to pull it off, even when they invest in dedicated in-store staff that can ably answer questions about home technology. The interesting thing about the new Target Connected Living Experience is that there’s almost no messaging around connectivity, other than connecting to the Internet — a major departure from the Open House store in San Francisco. 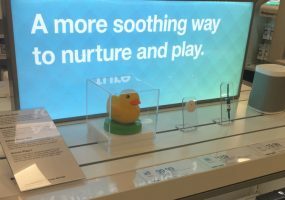 There are no home automation hubs on display in Minnesota, nor any apparent effort to showcase the Works with Nest ecosystem. I can’t say I disagree with the approach. Selling the integrated experience raises too many questions, scares consumers and ultimately limits sales. At the same time, offering too many product choices discourages shoppers from buying a product today. Right now. Instead, they must go home and think about it. 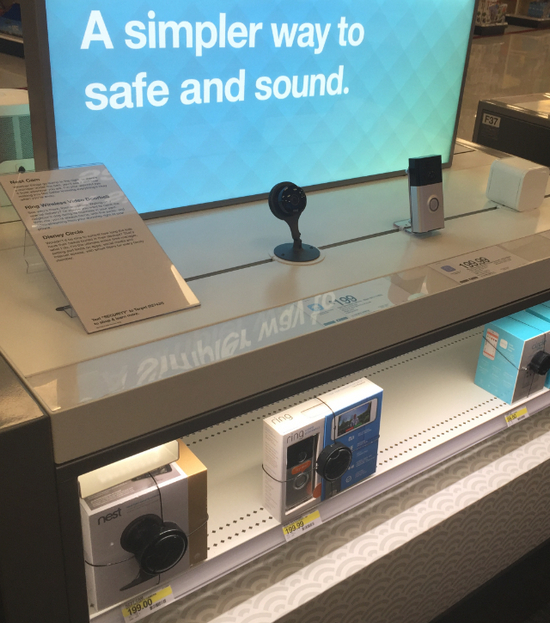 In Target’s case, the product selection doesn’t go deep or wide. There are few product categories and little choice in any given category. You can buy any doorbell cam you want, as long as it’s Ring. You can have any smart bulb as long as it’s Philips Hue. Middle America Not Ready for Home Automation? We’re all fond of seeing showcases of the connected home, where Mom wakes up and the lights slowly ramp up as she checks on the baby from her smartphone app and the coffee starts brewing. In reality, that stuff is complicated, both in concept and implementation.”I think people are at a different place than where we expected them to be,” Reck says. “There’s a lot of consumer education that needs to happen.”For now, Target seems likely to proceed with a model focused on simple point solutions, “but we also want to point to the potential,” says Reck. “We want to start showing them how things connect together.” At Ridgedale, integration is showcased in video loops of whole-house scenarios, while specially trained employees (Target says) are equipped to discuss smart-home possibilities beyond the Target “Experience.” So when will America be ready for the headier subject of home automation? Target isn’t sure right now, but the retailer aims to find out. Julie Jacobson, recipient of the 2014 CEA TechHome Leadership Award, is co-founder of EH Publishing, producer of CE Pro, Electronic House, Commercial Integrator, Security Sales and other leading technology publications. She currently spends most of her time writing for CE Pro in the areas of home automation, security, networked A/V and the business of home systems integration. Julie majored in Economics at the University of Michigan, spent a year abroad at Cambridge University, earned an MBA from the University of Texas at Austin, and has never taken a journalism class in her life. She’s a washed-up Ultimate Frisbee player currently residing in Carlsbad, Calif.